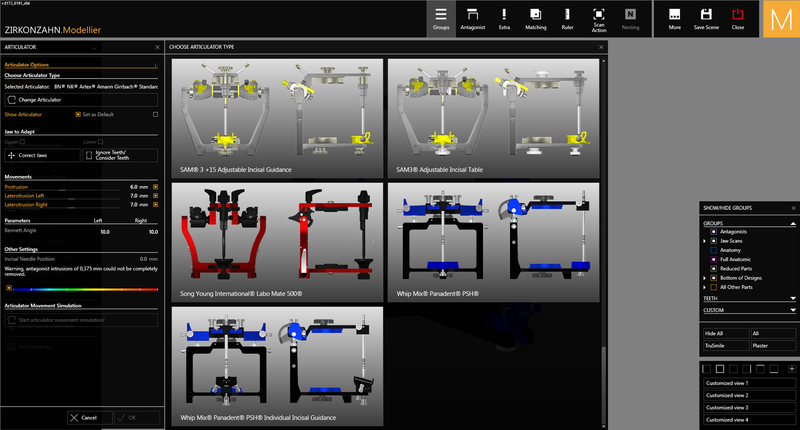 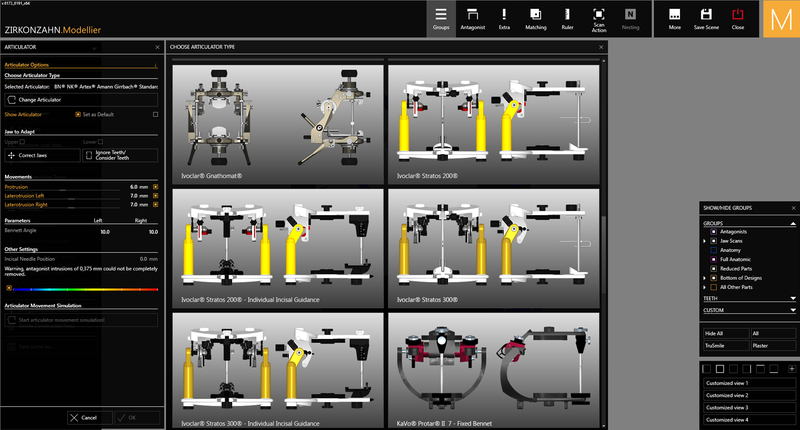 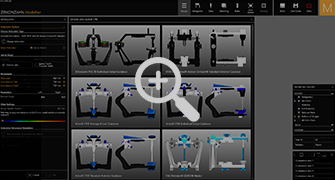 The Zirkonzahn.Modellier software, combined with the different software modules, makes nearly everything possible. 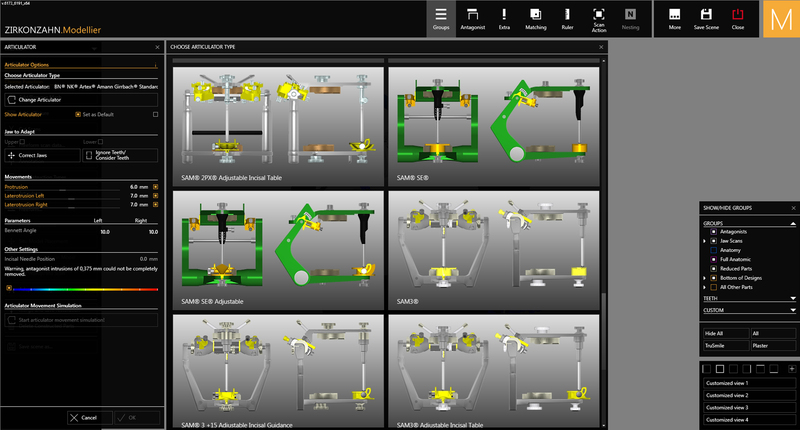 Above all, you can decide by yourselves how you want to do something: The wizard can guide you step by step through the entire design process or you can proceed individually using the master menu. 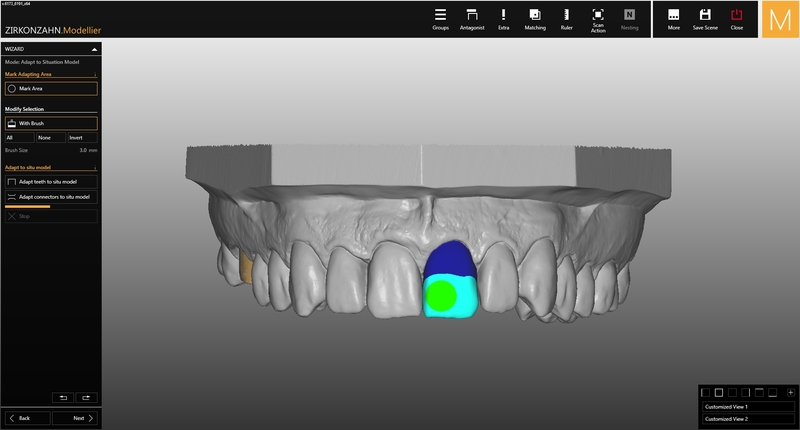 At any time it is possible to switch between these two options. 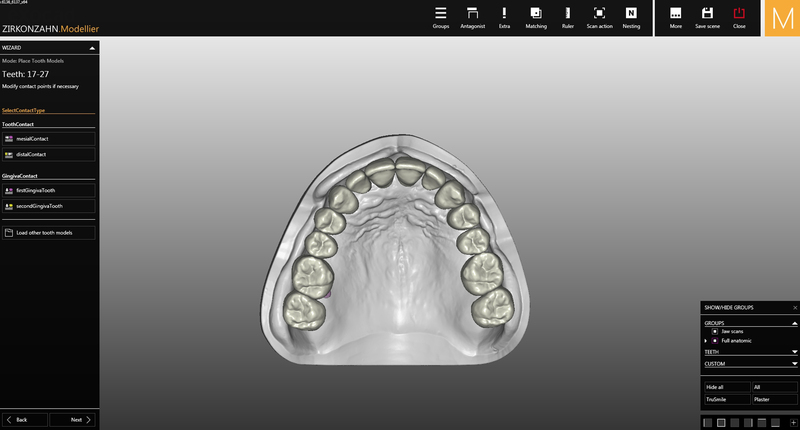 The software is compatible with intraoral scans, dicom data, 3D facial scans and different reference objects such as the Plaster Plane. 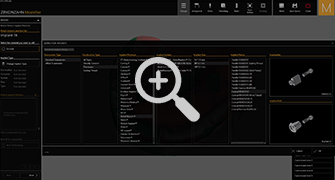 It is possible to import, process and export all current data formats. 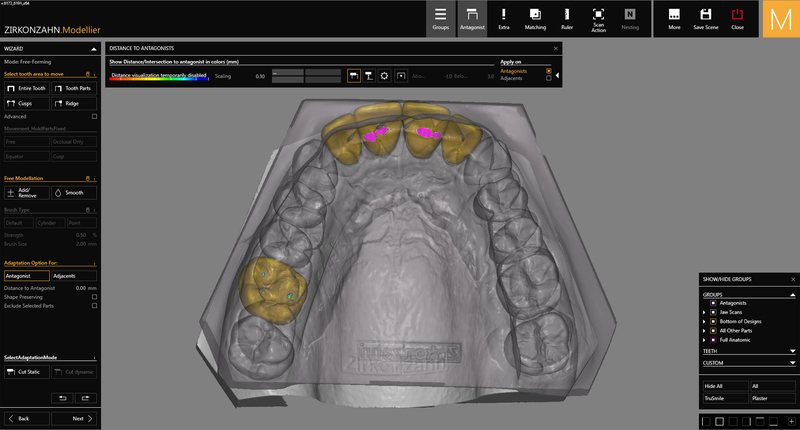 Many useful automatisms (for example detection of the preparation margin, automatic adjustment to the antagonist etc.) 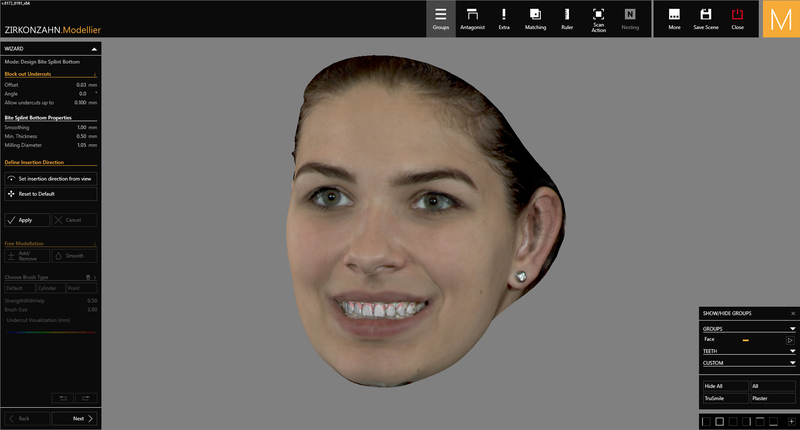 support the users during their workflow. 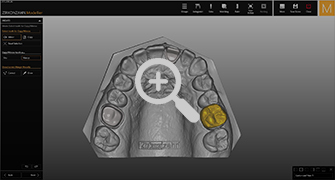 The vast libraries (implant systems, attachments, bars, tooth libraries) are continually being expanded (for example rooted teeth in the Heroes Collection). 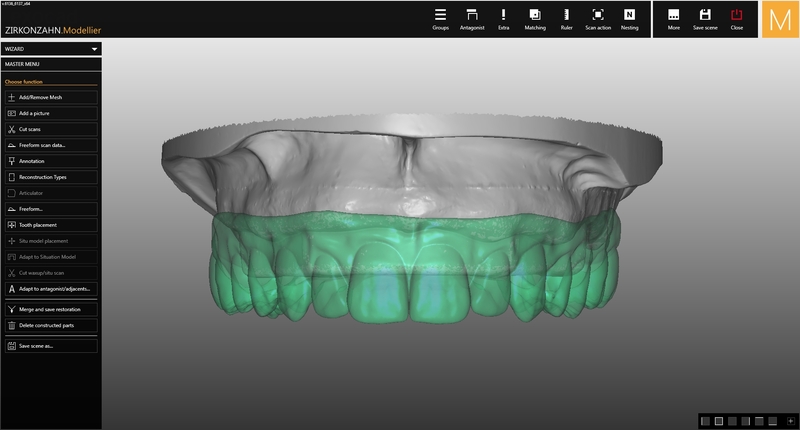 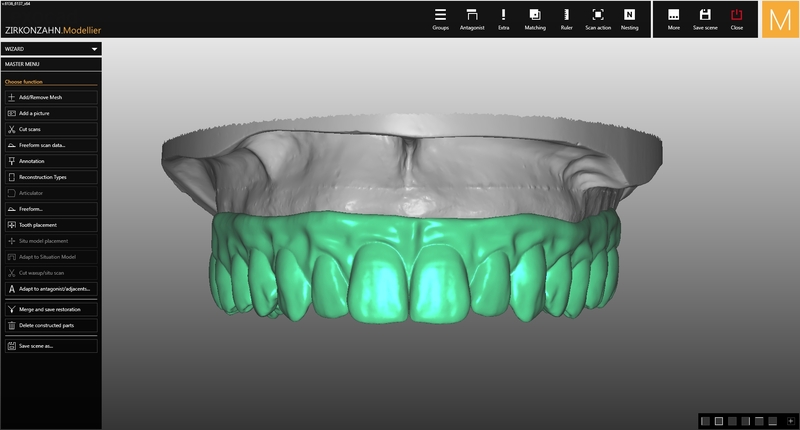 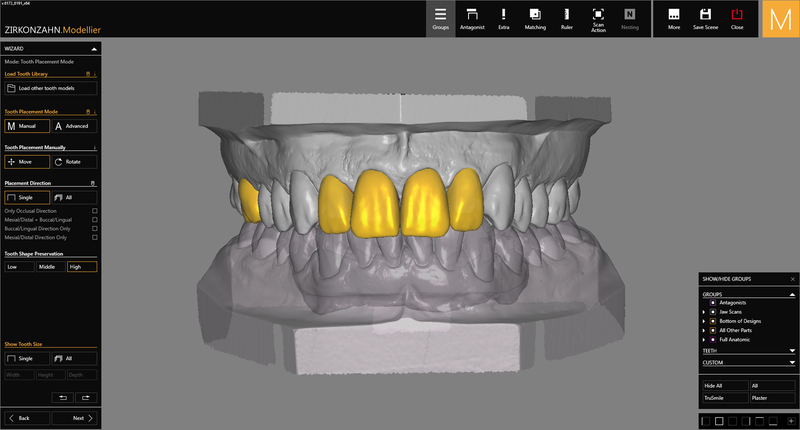 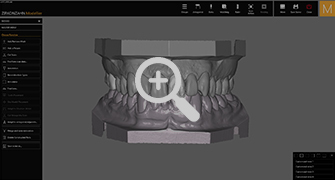 Moreover, our team of dental technicians and developers are working hard to continuously improve the visual and the functional features of the modelling software and to provide updates with new functions. 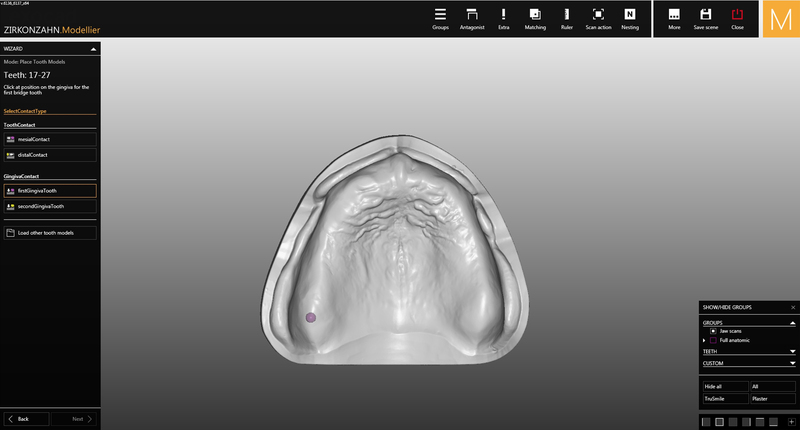 The teeth in the Heroes Collection AIDA virtual tooth library do already have roots. 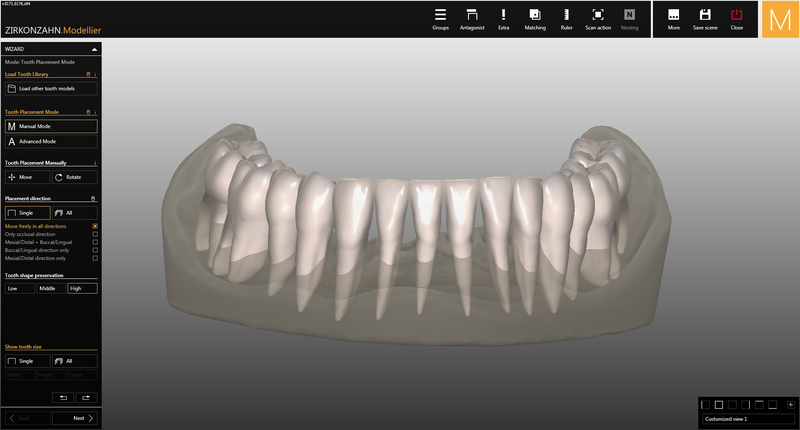 Also into the other nine tooth sets of the library, teeth with roots are continuously implemented. 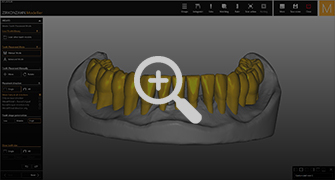 Rooted teeth help to determine the tooth axis and to create a more natural gingival line. 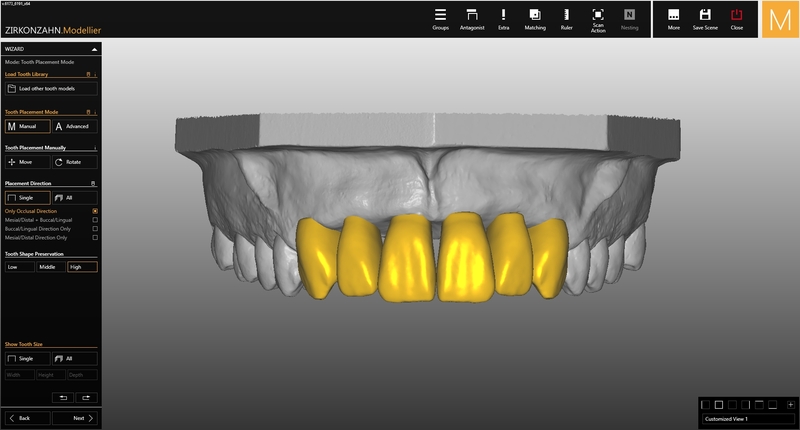 Rooted teeth are very useful, especially for large restorations with implants, where parts of bone are often missing. 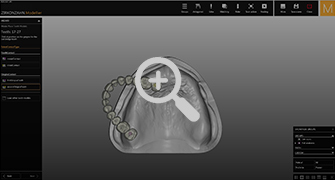 The presence of roots facilitates defining the tooth position. 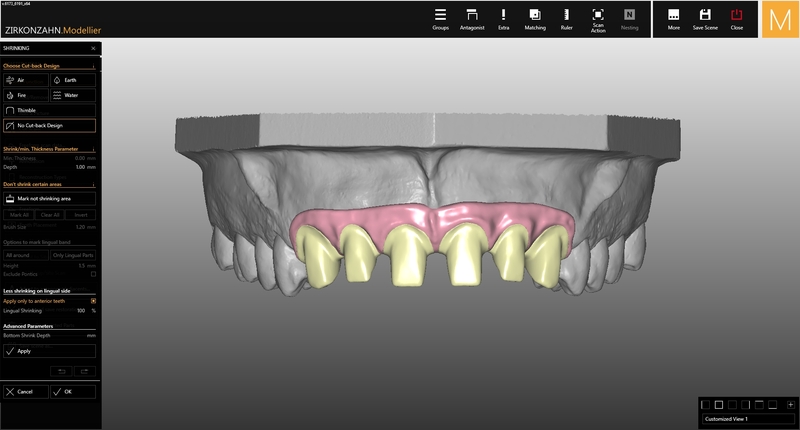 With the completely revised mirror and copy feature, single teeth can be copied or mirrored 1:1 . If you have a particularly aesthetic tooth, you can use it as model tooth (wax-up) and adapt the entire tooth to the restoration. 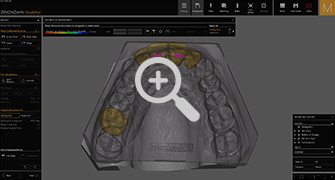 If you decide to use it as situ-scan, you can combine entire teeth or single tooth parts for the combination with virtual library teeth (e.g. 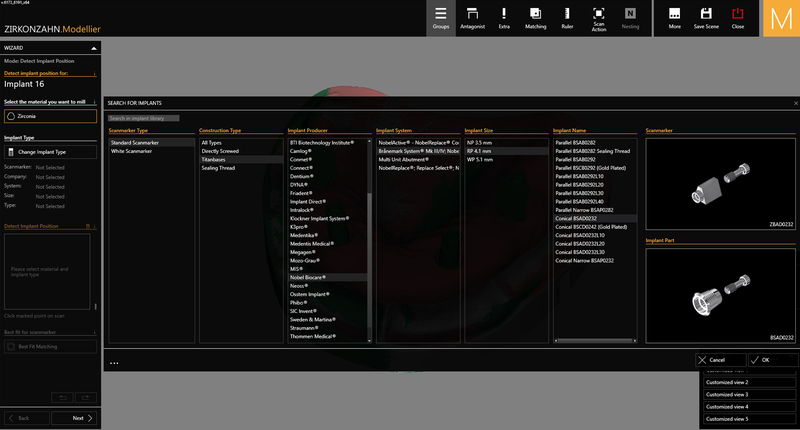 Heroes Collection). 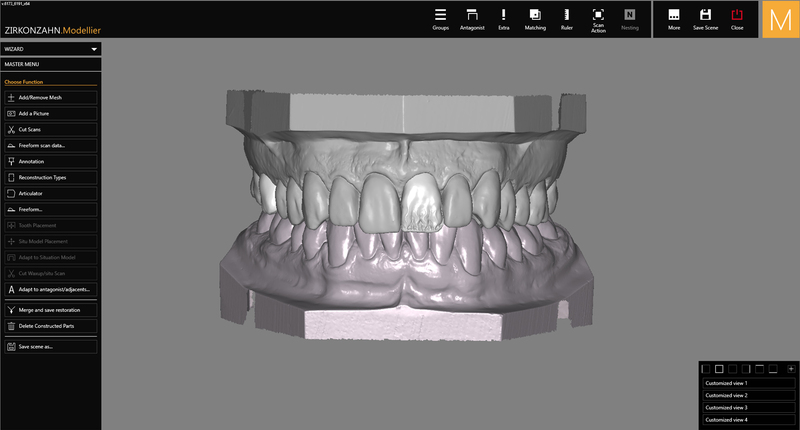 Thanks to the mirror and copy feature, the natural tooth aesthetics can be reproduced 1:1, resulting in an even more natural look. With the function “customised width” and the brush tool you can individually define the cement gap for the crown bottom for each tooth. 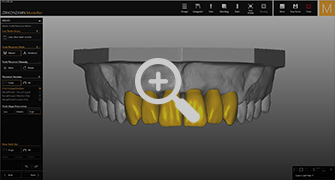 Like this, it is possible to determine the exact amount of cement which has to be applied in different regions. 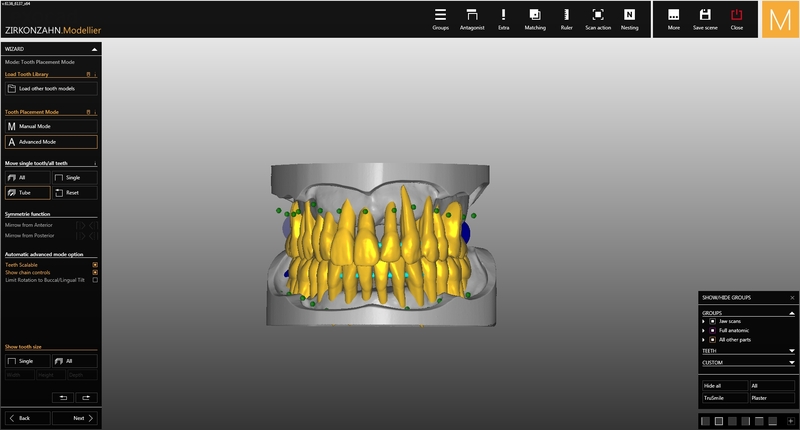 Thanks to the personalised cement gap, the fit of complex structures (especially with superstructures, secondary structures with telescopes) can be individually set and better guaranteed. 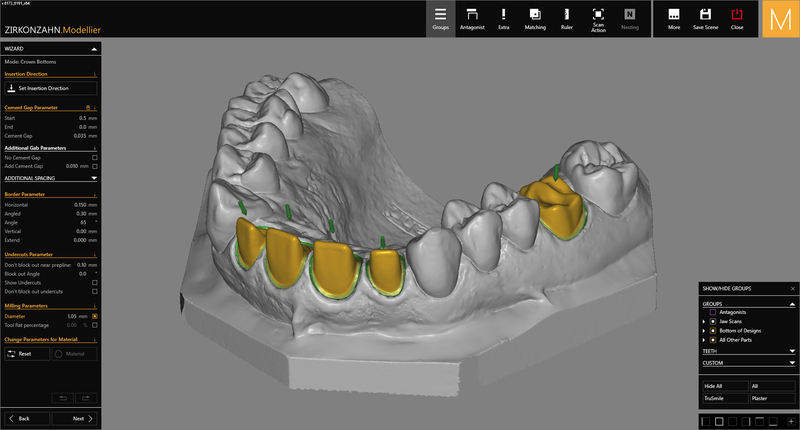 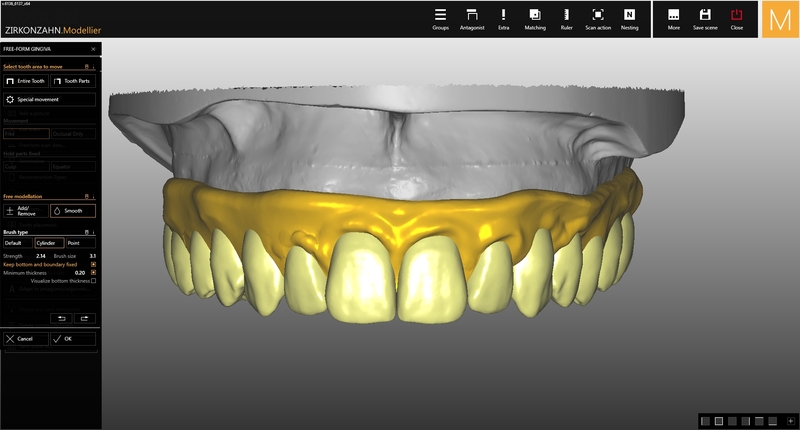 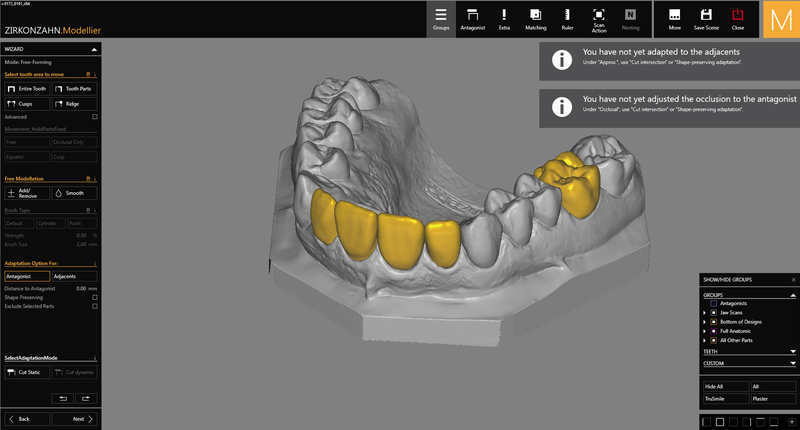 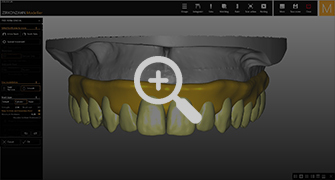 With the “place tooth models” mode, you can preliminary position the teeth within a few seconds. 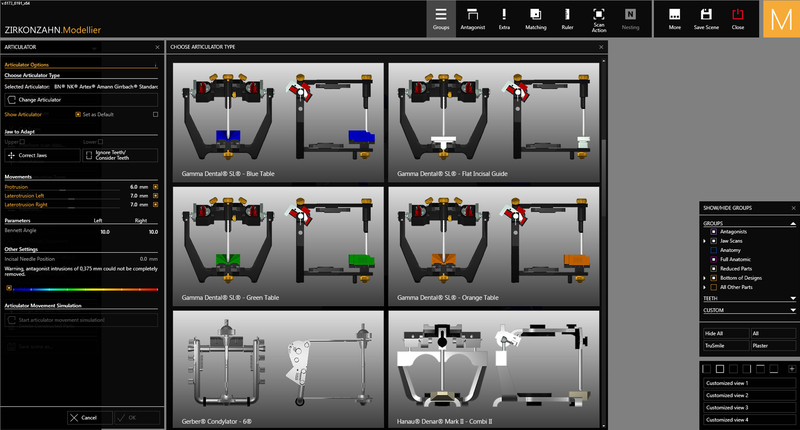 Just two position points have to be determined in the model to crate the setup. 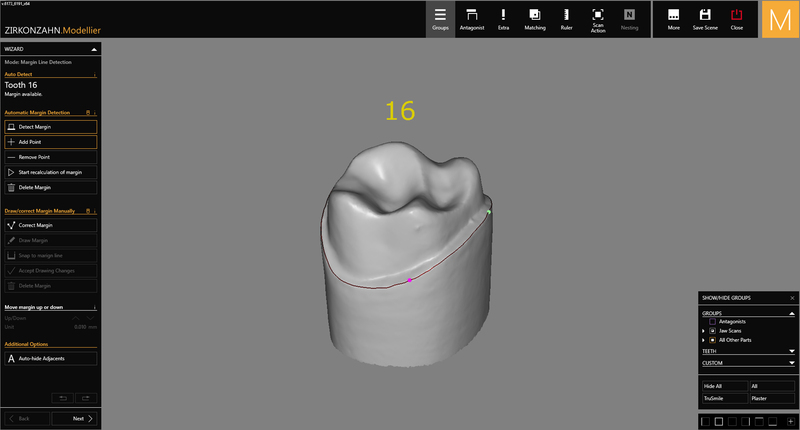 Then, the teeth are positioned automatically with perfect scale and interproximal areas. Thanks to this mode with intelligent tooth positioning, you can safe time when setting up the teeth. 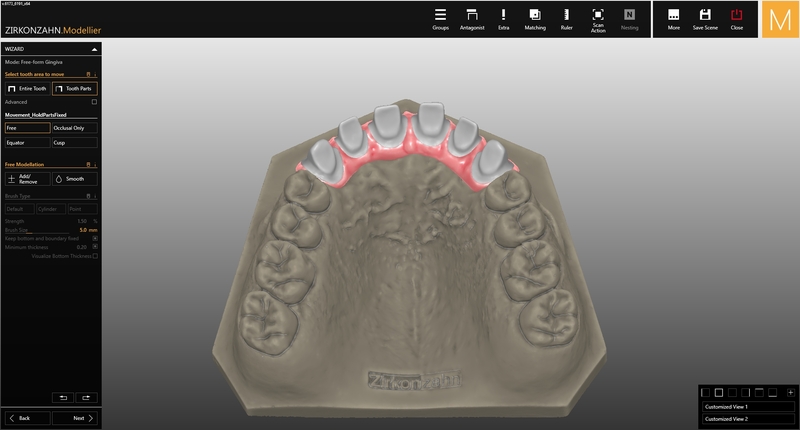 With the advanced positioning mode, it is much easier to place the teeth on the model. A kind of string of pearls connects all teeth and by clicking on “All”, they will move together. 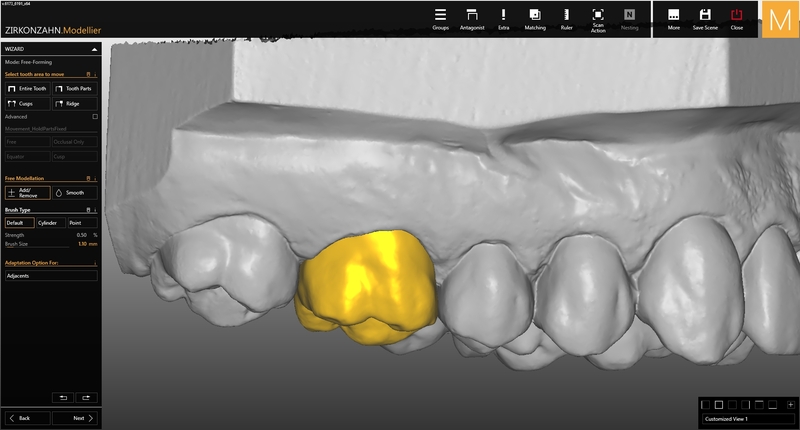 This string of pearls connection guarantees the constant contact between adjacent teeth when being moved (collision handling). 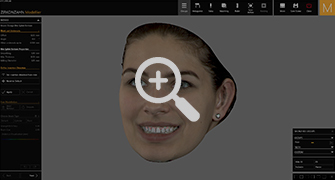 This function can be activated and deactivated as desired. 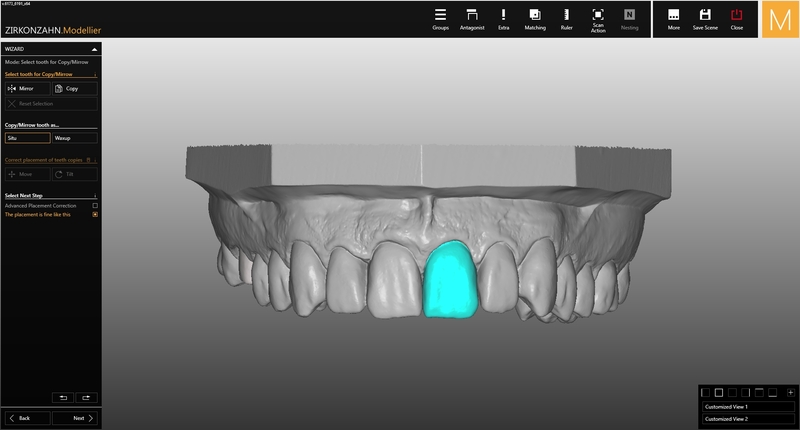 The option “single” allows you to position teeth separately also in consideration of the contact points. For the alignment of the midline, the dental arch can be moved with the “Tube” button. 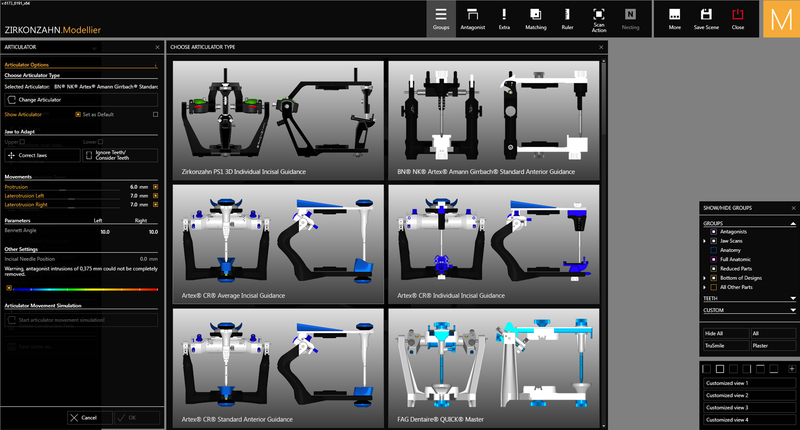 Also the advanced mode has a special mirror function with which the whole quadrant or the front area can be mirrored. Thanks to the easier and more natural tooth set-up, overlaps and much more can be avoided. This results in a more aesthetic tooth creation. 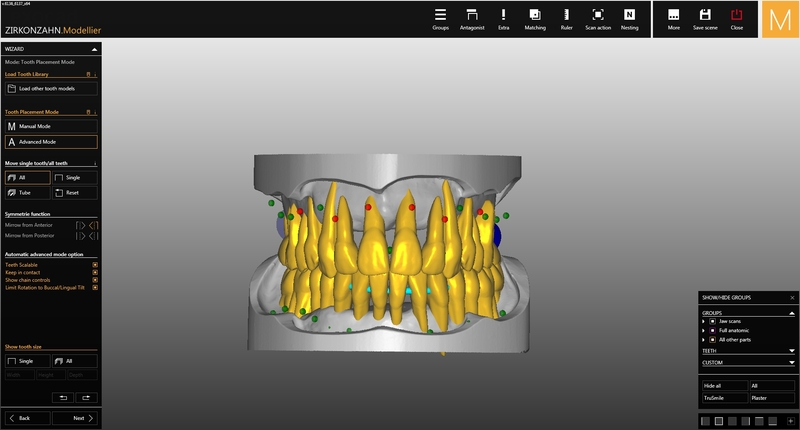 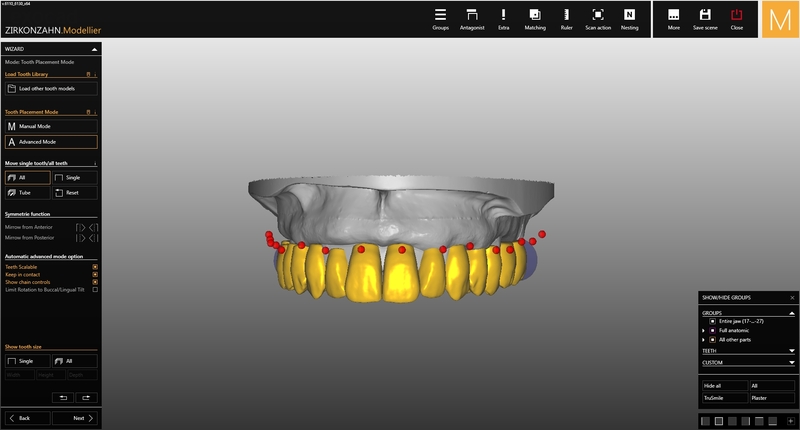 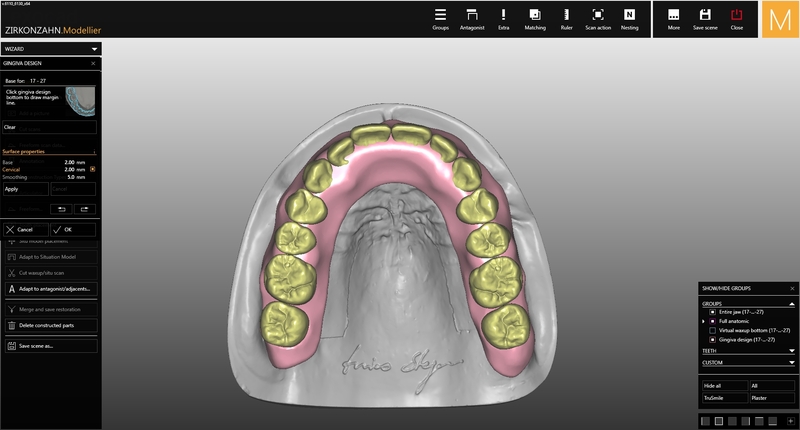 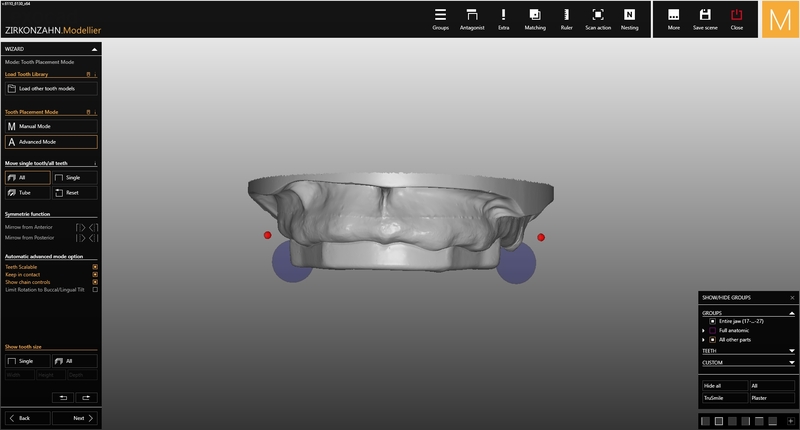 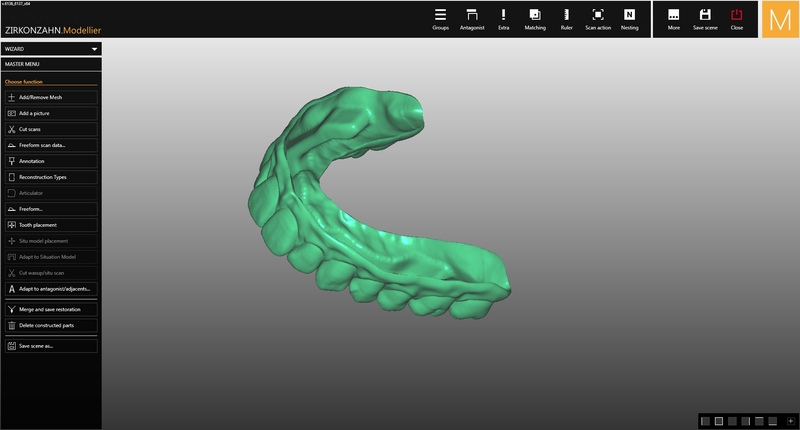 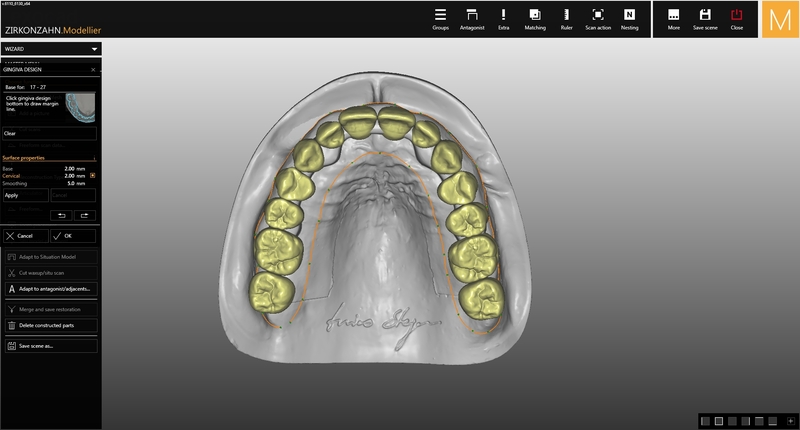 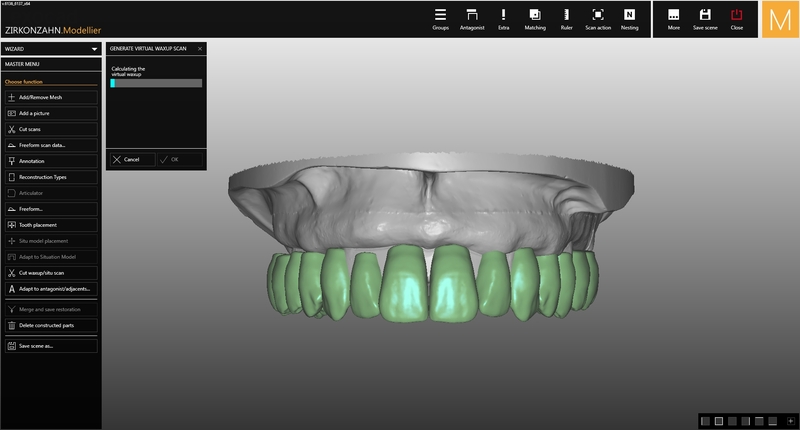 With the function Virtual Gingiva-Design for the virtual modellation of the gingiva, parts thereof can be perfectly adjusted to the tooth set-up. 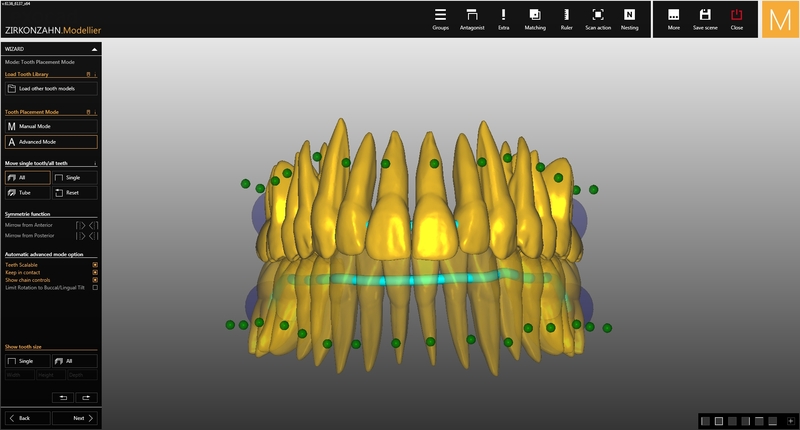 The “special movement” feature in the free-forming mode makes it possible to define single gingival areas as fixed or moveable. Like this, they can be positioned in the interdental space as desired. 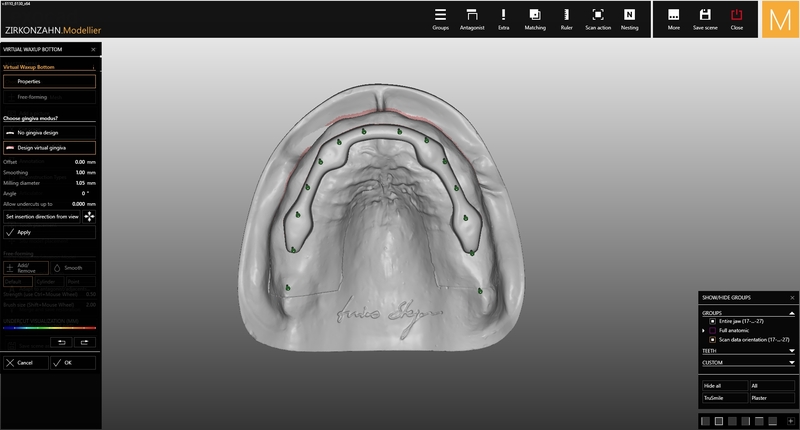 With the feature “Shrink gingiva design part” the virtual gingiva is reduced. 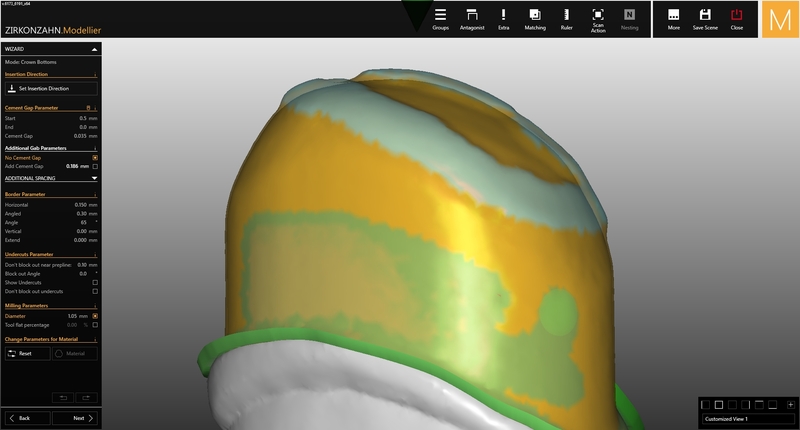 This feature can be carried out several times in a row (multi level cutback). 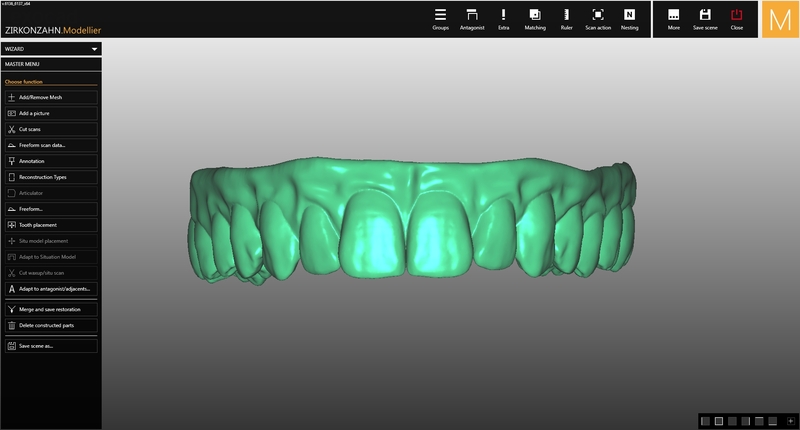 By repeatedly reducing the gingiva, different application thicknesses for ceramic or resin veneering can be created. 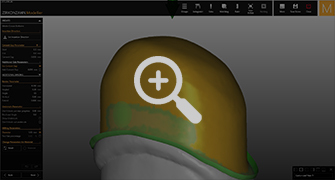 Adding and removing the material can be done as usual with the corresponding “Add- Remove” function. 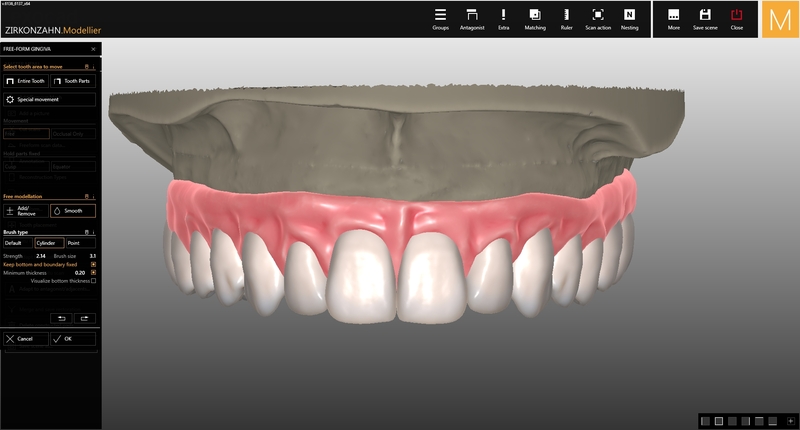 With the Virtual Gingiva-Design and a wide range of design possibilities, a nuanced gingival aesthetic can be reached. 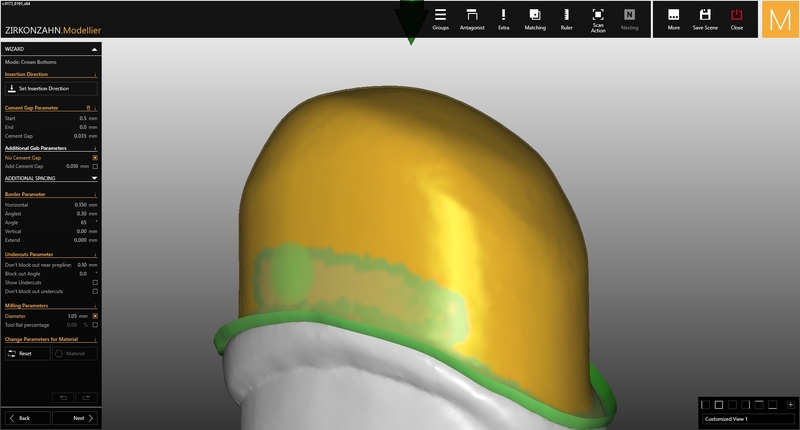 Like this, the aesthetics of the entire restoration improves. 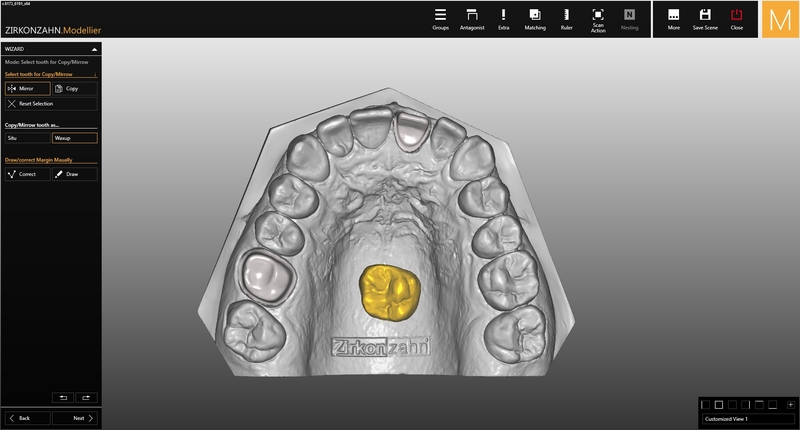 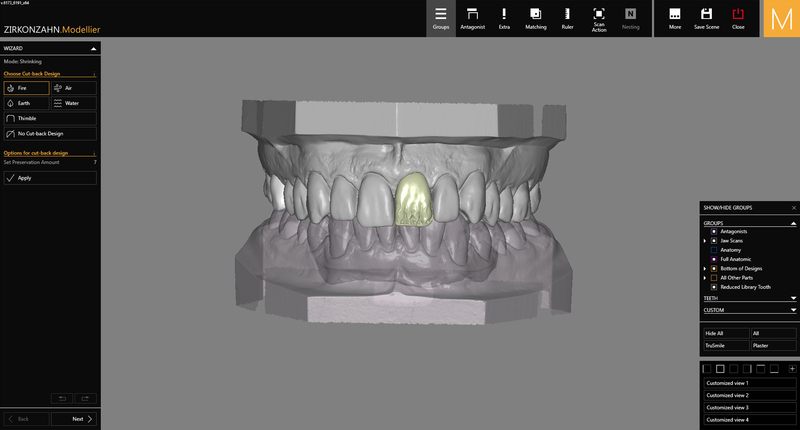 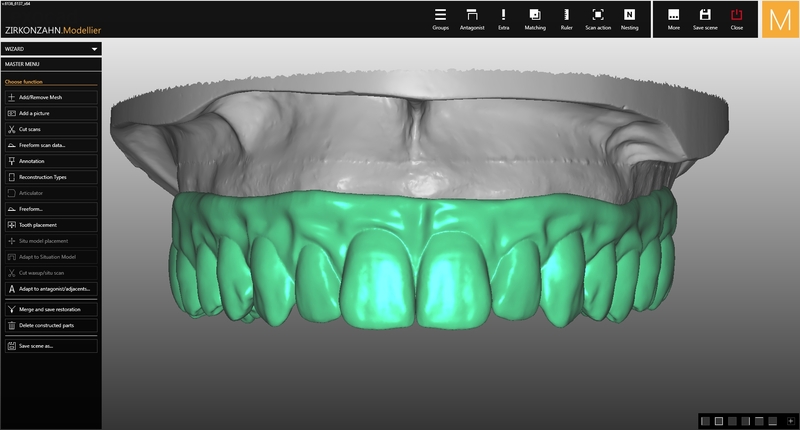 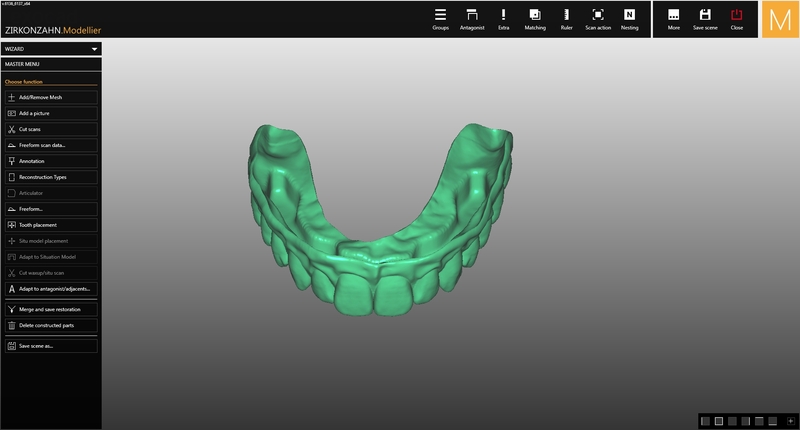 In the updated Zikonzahn.Modellier software, once the tooth set-up and the gingiva have been designed, they can be used to create a virtual wax-up (“generate virtual wax-up scan”). 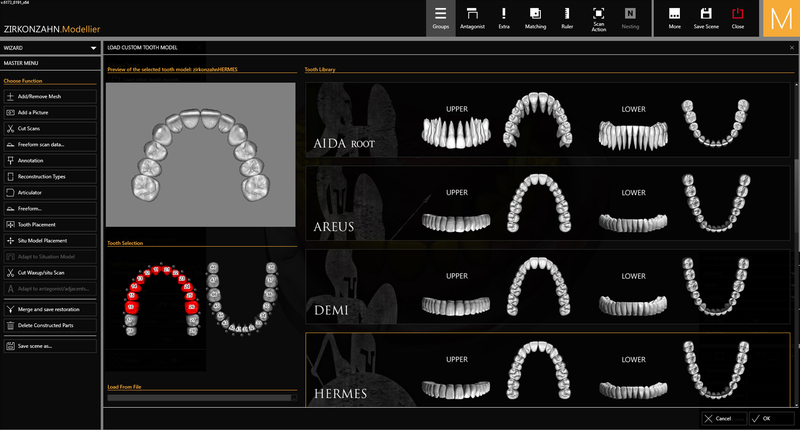 This means, that for the wax-up also the natural tooth sets in the „Heroes Collection“ virtual library can be used. 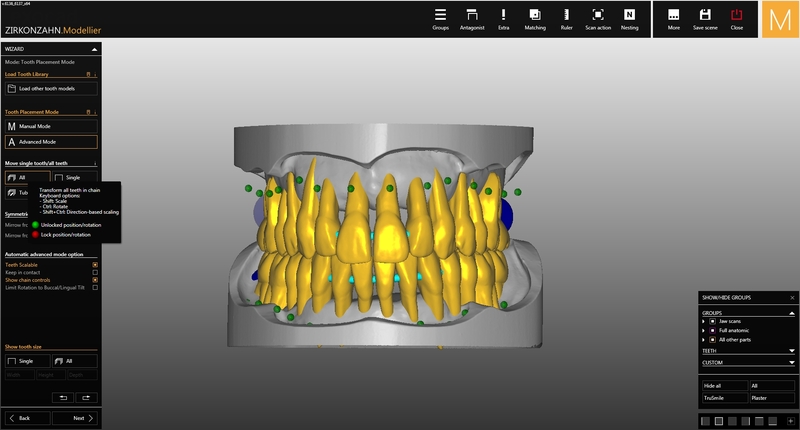 With this function very simple secondary structures, for example on bars, can be realised. Set-ups for the subsequent implant planning can be created. 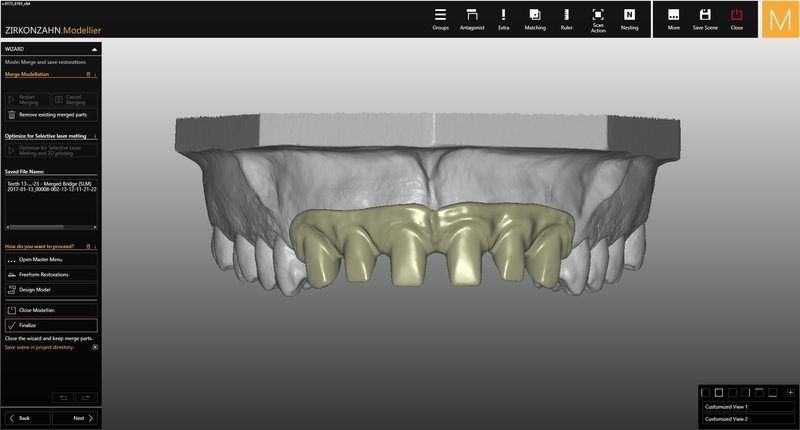 Furthermore, thanks to the milling of the entire tooth set-up (prototype), a fast try-in for aesthetic purposes is possible. 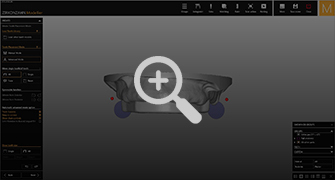 This prototype can be modified and then, by scanning it once again, used for the final job. 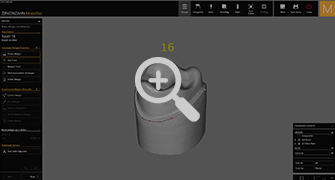 In the new software version dies for teeth stored in the “Heroes Collection” can be generated in the “Thimble” function and manually adjusted by means of the “free-forming” option. 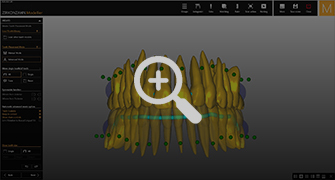 Thanks to this function, restorations consisting of a primary and secondary structure (hybrid construction) can be created faster, e.g. Tecno Med Mineral primary structures with cemented Prettau® Anterior® single crowns.